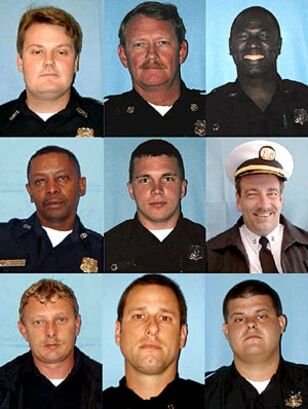 Nine firefighters lost their lives in the Charleston blaze. Top row, from left: Bradford "Brad" Baity, Capt. Mike Benke, Melvin Champaign. Middle row: James "Earl" Drayton, Michael French, Capt. William "Billy" Hutchinson. Bottom row: Mark Kelsey, Capt. Louis Mulkey, Brandon Thompson.